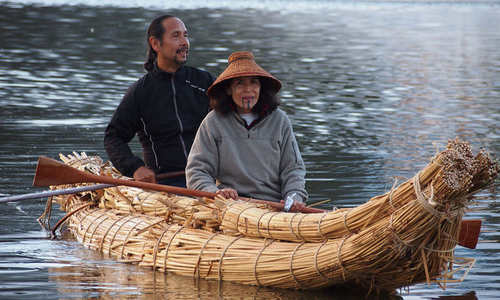 Since 1985 The Cultural Conservancy (TCC) has served as a leader in the local, regional, and national Indigenous rights movement, working with conservation organizations, land trusts, environmental justice coalitions, and others on a variety of key programs to implement its mission of preserving and revitalizing Indigenous cultures, empowering them in the direct application of their traditional knowledge and practices on their ancestral lands. Located in San Francisco, California, TCC has enlarged its mission in the last few years to be globally aligned and in leadership with other Indigenous-led organizations around the world – especially in the areas of traditional Native foodways and guardianship of sacred waters. In this wider capacity TCC works with California Indian tribes, Native Americans around the US and Canada, Hawaiians and other Pacific Islanders, and Indigenous communities in South America on a wide variety of community-based projects, from sacred site protection to the revitalization of endangered languages and song traditions. TCC recently launched a podcast, The Native Seed Pod, that explores and celebrates Native Foodways, Ancestral Seeds, and the Traditional Ecological Knowledge needed to renew the health of the Earth and all our relations.